Objective: To evaluate effects of a Pilates intervention on balance and function in community-dwelling older (aged 60y) adults. Design: Randomized crossover study design lasting 16 weeks. Setting: University exercise clinic. Participants: Ambulatory older community-dwelling adults (N=32) were recruited, and 27 (mean +/- SD age, 67.3+/-6.5y) completed the program. Intervention: Participants were allocated to either 5 weeks of a group Pilates training intervention or 5 weeks of usual activity (control). After a 6-week washout period, participants performed the alternate intervention. Main Outcome Measures: Static and dynamic balance measures (mediolateral sway range, Four Square Step Test, Timed Up and Go Test) and leg strength were recorded at 4 times before and after each intervention (baseline [t1], interim time immediately after the first group intervention [t2], after 5-week washout [before the second intervention period] [t3], and at study conclusion after the second group intervention [t4]). 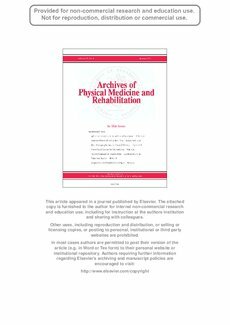 Results: There were no significant differences between the Pilates and control groups for any measured variables (P>.05) despite static and dynamic balance significantly improving during the study and from pre- to post-Pilates (P<.05) without significant changes occurring during the control phase. Improvements that occurred during Pilates between t1 and t2 did not return to baseline after the washout period (t3). There were no changes in leg strength. Mediolateral sway range standing on a foam cushion with eyes closed improved -1.64cm (95% confidence interval, -2.47 to -0.82) and had the largest effect size post-Pilates (d=.72). Conclusions: Although there were no significant betweengroup differences, participation in the Pilates component of the study led to improved static and dynamic balance. The absence of differences between conditions may be a result of smallsample size or the crossover study design because Pilates may produce neuromuscular adaptations of unknown resilience.